The SAFESPACE™ products offer protection from the many forms of chaotic information assaulting our bodies and environments. Each product addresses toxins in very specific ways to clear and protect one from detrimental electromagnetic fields, earth radiations, as well as other harmful energies. All products are designed to work together. When used in combination a more thorough clearing with deeper layers of protection occurs. Please use the Product Selection Guide to the right to help you determine the best Safe Space Protection product for your needs. For complete product descriptions and pricing see below. 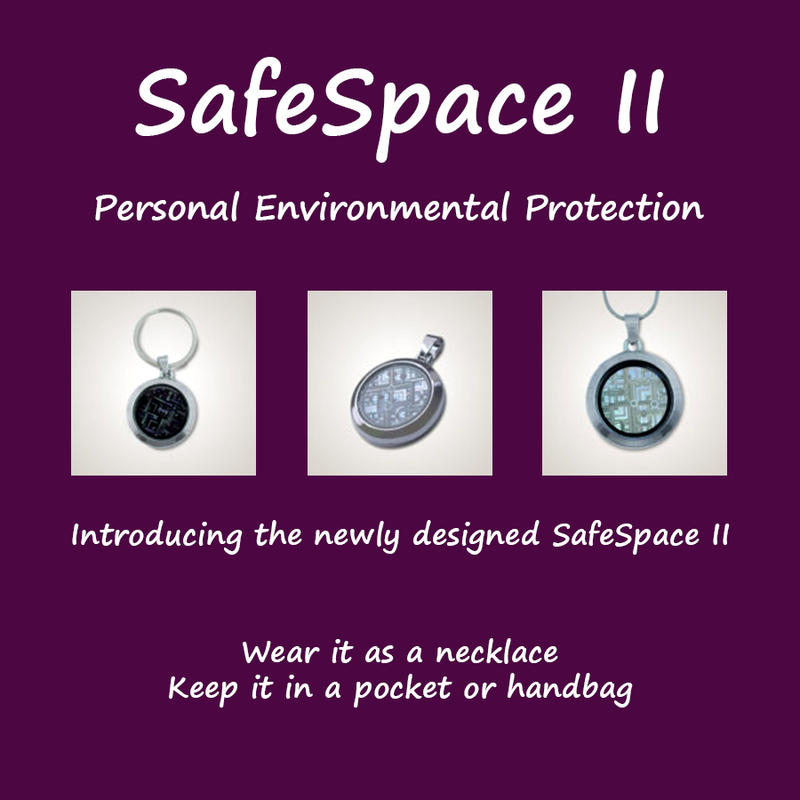 SafeSpace II – Personal Environmental Protection The SafeSpace II radiates a 7 foot circular field of protection around the body. New Design! This 1-inch pendant provides a seven-foot circle of protection, shielding you from the toxic effects of electromagnetic fields, Wi-Fi, geopathic stress zones and other forms of environmental stress. It is ideal for work situations and other Wi-Fi saturated environments, as well as for travel. The encoded frequencies will protect you from the toxic effects of harmful EMFs as it converts them to harmonious waves that support health and vitality. Thoroughly tested and proven via kinesiology and electrodiagnostics, the SafeSpace II is designed to be kept on or close to the body. The pendant is worn on the body to establish a field of energy that harmonizes, balances, strengthens and energizes the cells, tissues and organs of the body. Through its influence on the human energy field, the Vitaplex supports the body’s ability to purify, rebalance and regenerate. The primary feature of the Vitaplex is its unique interaction with the particular energy field of each individual. 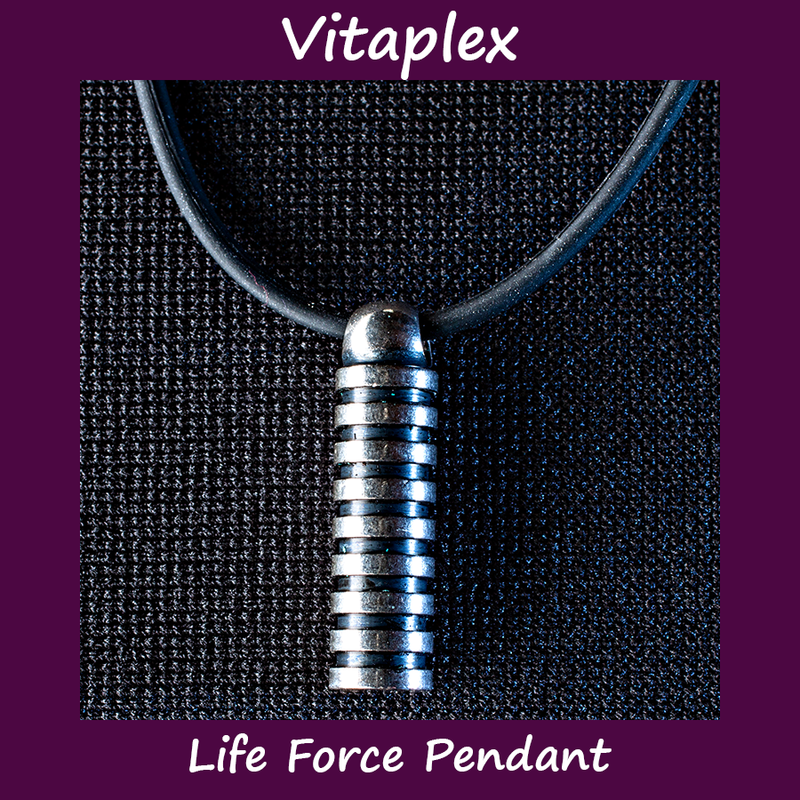 Unlike other pendants, magnets or gems, the Vitaplex continually changes its “broadcasting” to the energy field of an individual as his or her condition changes on a daily basis. In doing so, the Vitaplex – Protects: It is designed to keep the body-mind and the nervous system in a state of equanimity by clearing the effects of environmental stress and balancing the related disharmonious energy patterns. Clears: Regular use of the Vitaplex helps to counteract the damaging effects of toxins by stimulating the body’s vital life force by arousing the immune response so that harmony is restored. The frequency patterns in the Vitaplex also help to clear negative emotional patterns, thoughts, and feelings. Energizes: The Vitaplex establishes a field of energy that harmonizes, balances, strengthens and energizes the cells, tissues, and organs of the body. It enhances alertness and vitality. The Vitaplex is stable as testing shows its ability to radiate a powerful field of protection cannot be neutralized or altered by temperature, electromagnetic fields, magnets, strong odors or chemicals. 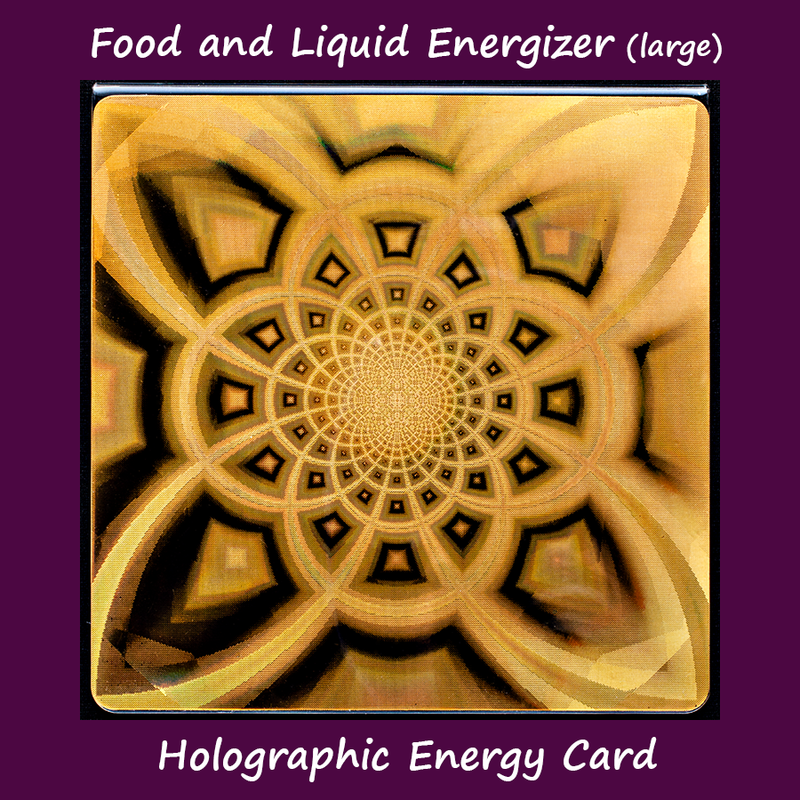 The Food Liquid Energizer consists of a hologram, which is permanently imprinted with vibrational frequencies that clear, reenergize, and balance foods, substances and liquids. A tremendous amount of food value is lost through modern processing including early harvesting, cooking, pasteurization, freezing, canning, refining, storage, and transportation. Chemicals, pesticides, irradiation, preservative and metallic residue in our food and water supply, are all causing serious depletion in the enzyme, vitamin and mineral content of what we eat and drink. The energetic correction provided by the Food Liquid Energizer cards will pass through packaging such as metal, plastics, glass and ceramics. Simply place the card under or near the food for a few minutes. The large, 6 x 6 inch Food Liquid Energizer is ideal for kitchen use. 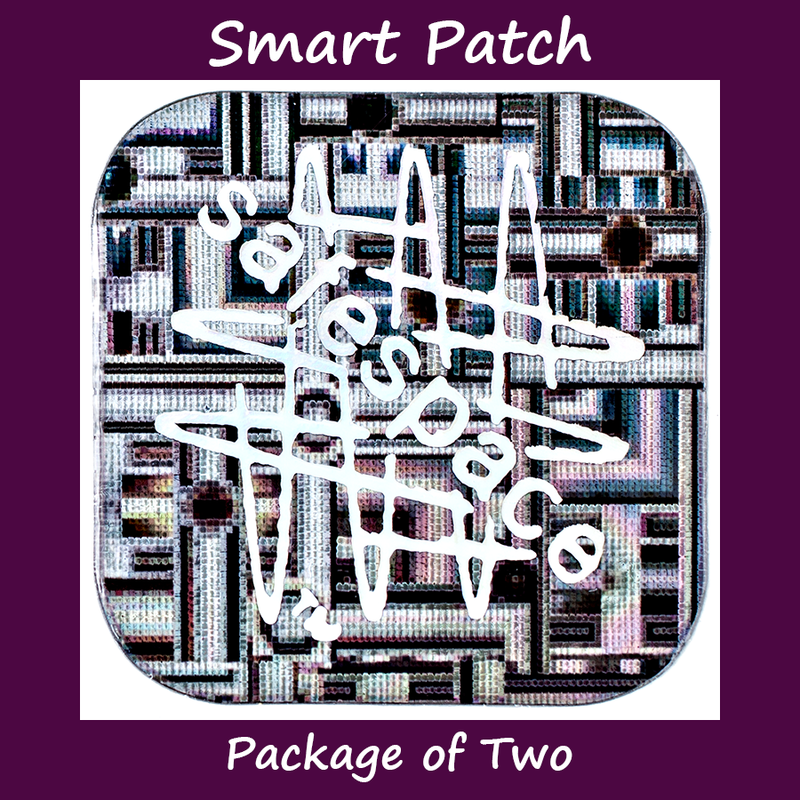 It will energize bags of groceries, and prepared meals placed within 3 feet of the card. Scientific studies have shown that the constant bombardment of harmful radiation from electromagnetic fields (EMFs) creates biological stress that can lead to serious health consequences. The Radiant Room hologram radiates a powerful field into a single room converting toxic EMFs to biologically safe fields. Chaotic fields are transformed, and a tangible feeling of peace is generated to enhance any single space of up to 400 square feet. Single room clearing for travel, home, and office including: small work areas, bedrooms, motel / hotel rooms, hospital rooms, study areas, and automobiles. The Radiant Room hologram will begin working immediately when placed in a room. Simply remove it from its velour storage pouch and position on any flat surface. 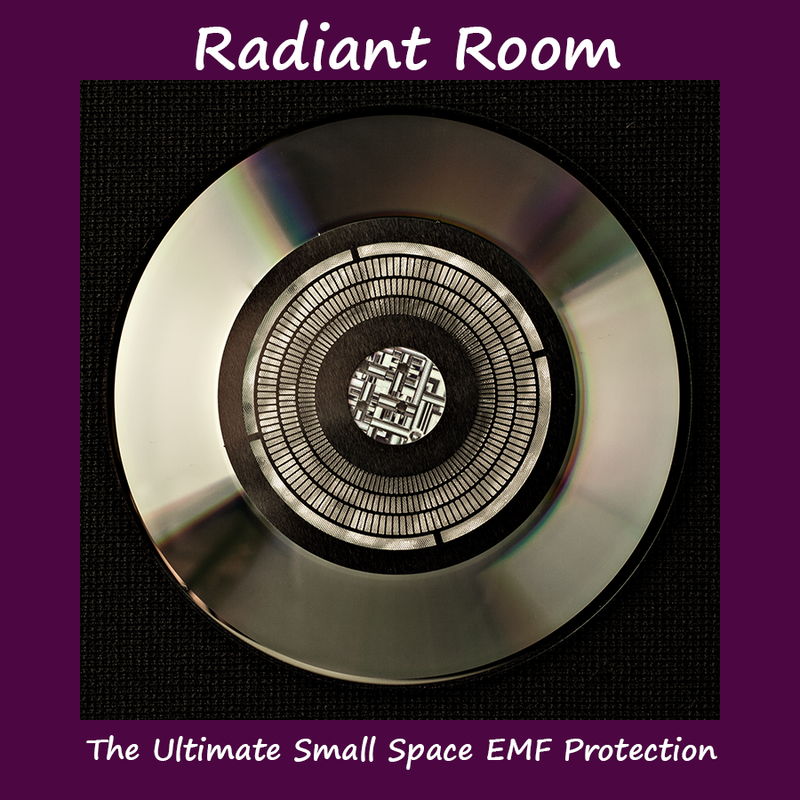 The Radiant Room will continue to convert toxic EMFs and protect from other detrimental vibrational energies for as long as it remains in the room. Unlike other manufacturers’ devices, the energetic encoding of the Radiant Room hologram is permanent, and cannot be neutralized or altered by temperature, electromagnetic fields, magnets, strong odors or chemicals. 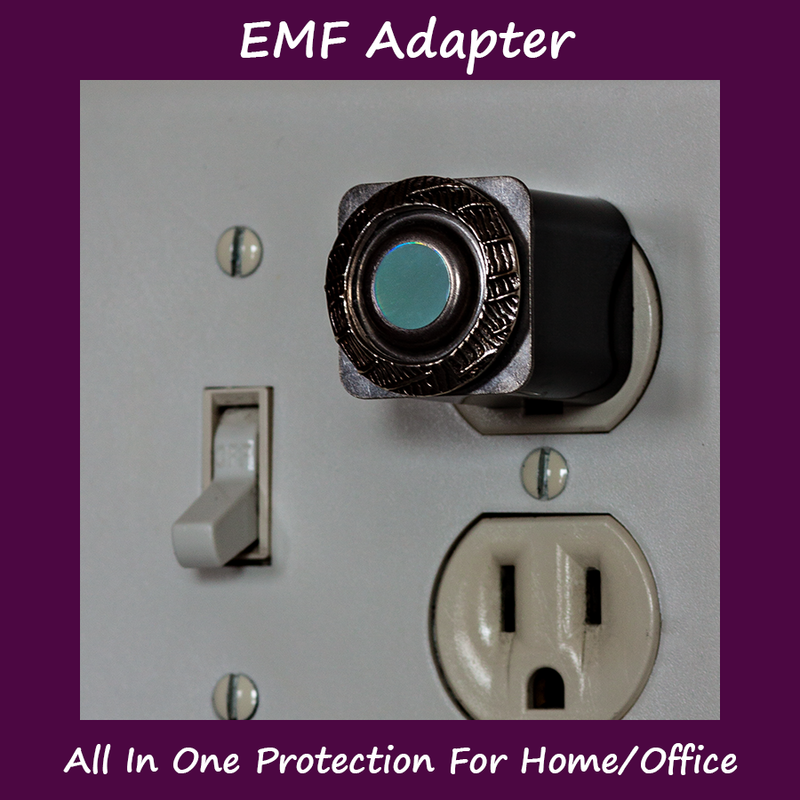 The SafeSpace EMF Adapter sends a corrective, harmonizing resonance through any appliance plugged into the circuit. 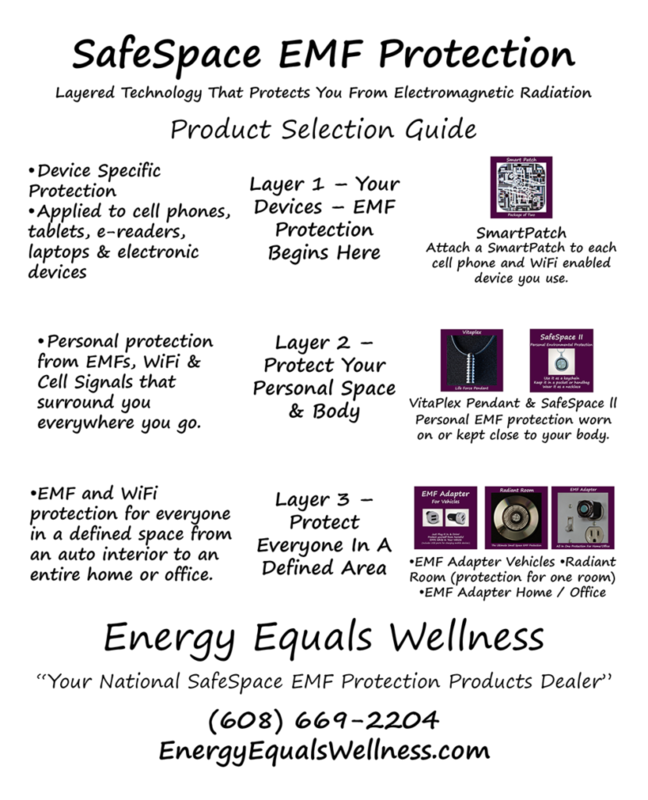 The SafeSpace EMF Adapter is proven to neutralize toxic EMFs and restore balance and tranquility to your environment! The GeoResonators (GR) tiles are designed to be planted in the ground. Once planted they begin to work immediately, and a field of vibration identical to the healing properties in the GR is set up and carried through the soil and the atmosphere. The GeoResonators can be used in yards, parks, and neighborhoods, and offer excellent protection from geopathic stress around any home or larger building. Geopathic stress occurs naturally, and geopathic zones can also be created by modern technology. Geopathic stress has been found to be a common factor in many serious and minor illnesses and psychological conditions, especially those conditions in which the immune system is severely compromised. It’s easy to plant the GR tiles in the earth. Using a trowel, create a slot 4 to 6 inches deep. Then slide the plastic case (tile) into the slot horizontally. Setting up a matrix of four, one GeoResonator planted at each of the four corners of one’s property, will correct toxic geopathic emissions from the area within the matrix. Larger green areas (5 acres) can also be treated with a single pack of four GeoResonators. This is ideal for parklands and wooded areas. Use GeoResonators to harmonize the toxic effect from cell towers, high-tension pylons, satellite towers, electrical street poles, or transformer boxes. 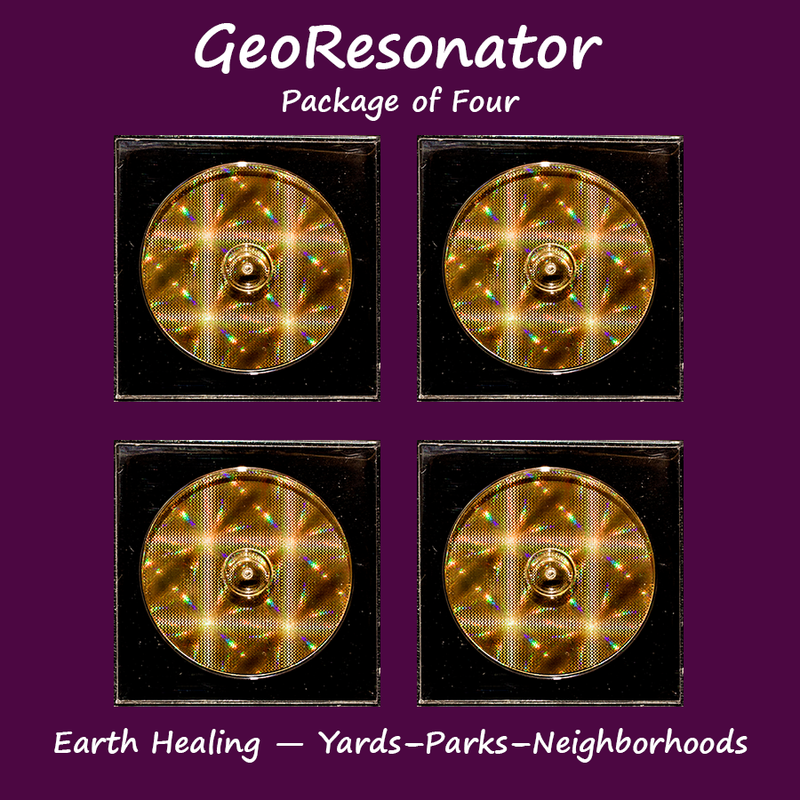 Complete instructions are included with each package of four GeoResonators.